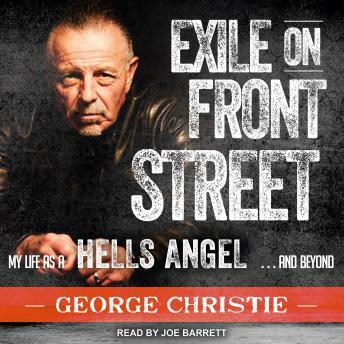 After forty years in the Hells Angels, George Christie was ready to retire. As president of the high-profile Ventura charter of the club, he had been the yin to Sonny Barger's yang. Barger was the reckless figurehead and de facto world leader of the Hells Angels. Christie was the negotiator, the spokesman, the thinker, the guy who smoothed things out. He was the one who carried the Olympic torch and counted movie stars, artists, rock musicians, and police chief captains among his friends. But leaving the Hells Angels isn't easy, and within two weeks of retirement, he was told he was 'out bad'-blackballed by his fellow Angels, prohibited from wearing the club patch, and even told he should remove his Death Head tattoo. Now Christie sets out to tell his story. Exile on Front Street is the tale of how a former Marine gave up a comfortable job with the Department of Defense and swore allegiance to the Hells Angels. In this revealing, hard-hitting memoir, he recounts his life as an outlaw biker with the world's most infamous motorcycle club.